The informant told your affiant they request to remain confidential due to the fact that he/she is a member of the local community. The informant said he/she feared bodily harm, as well as retaliation against his/her family members if his/her identity is revealed. It has been your affiants experience that informants have had bodily harm done to them after their names have been revealed to defendants. Also, your affiant feels that if an informant's name were revealed, their usefulness to law enforcement would be greatly impaired in future cases. With your affiants experience in the past dealing with persons in possession of narcotics, I have found that when a search warrant is served, on occasions there are several people inside the location who do not live there. After searching these people and their vehicles they are in control of, I have found that these persons are in the residence for the purpose of buying narcotics and have found that either narcotics or drugs are on their person or in their vehicles. Your gffiant has also found that persons arriving at the location by either foot or in a vehicle are also there for the purposes of purchasing narcotics or narcotic related offenses. It is my experience that persons place phone calls to a residence involving illegal narcotic activ ity to either set an appointment for pickup at the location or to have the narcotics delivered to them. 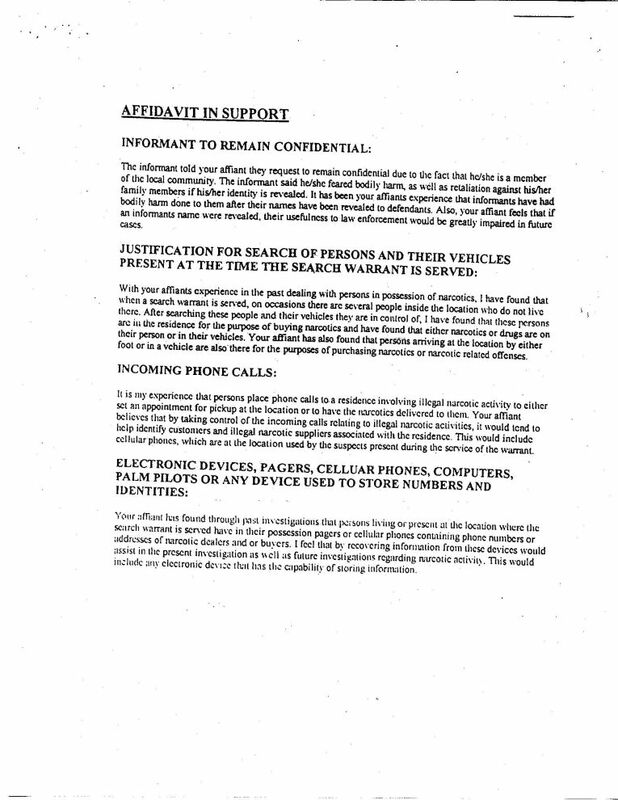 Your affiant believes that by taking control of the incoming calls relating to illegal narcotic activities, it would tend to help identify customers and illegal narcotic suppliers associated with the residence this would include cellular phones, which are at the location used by the suspects present during the service of the warrant. Your affiant has found through past investigations that persons living or present at the location where the search warrant is served have in their possession pagers or cellular phones containing phone numbers or addresses or narcotic dealers and or buyers. I feel that by recovering information from these devices would assit in the present investigation as well as future investigations regarding narcotic activity. This would include any electronic device that has the capability of storing information.